I don’t know the name of the fabric this dress is made of, but it is very light and soft (like flannel). It’s the kind of fabric would be good to make a pair of summer pajamas out of. I didn’t use a pattern for this dress. The shirring on the top was already done, which gave me the idea for this dress. I measured her front from armpit to armpit, straight across, because I knew the fabric was stretchable. I also measure the back the same way. I added a little extra in the back, so I could put Velcro on. In the end, the front was 6 inches, and the back was 8 inches. If I were to do it again, I would do the back 7 1/2 inches or even 7 inches, since the back isn’t tight fitting. I cut the back piece down the middle, then stitched it back together almost all the way to the top, but left enough so I would have room for adding Velcro. I attached the front and the back, and hemmed the bottom. The straps I attached on the front, and the stitches aren’t hidden. I thought it looked better with a little V.
The dress was very simple to make. To do the shirring/smocking yourself, all you would need to do is hook up your sewing machine with elastic thread and stitch! I, however, do not have a sewing machine so I must take advantage of pre-sewn fancies. 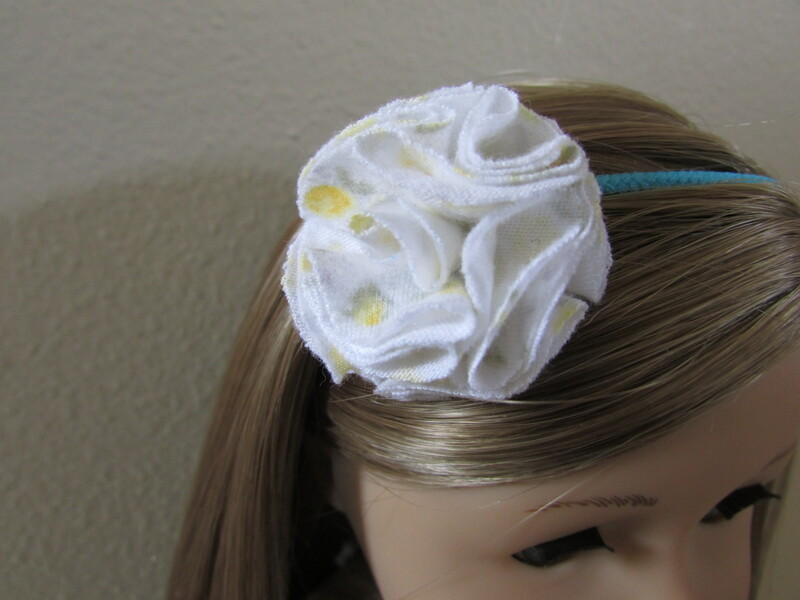 The fabric flower is currently sewn to a regular human sized hair tie, which is stretchy enough to go over the doll’s head. When I have a hair clip available, I’m going to take the flower off the hair tie and hot glue it to the clip. I think that would be much better then a headband, especially one that is turquoise and doesn’t match the dress! Anyway, the fabric flower I found here and I did it exactly the way the directions said, except I had to size it down. Any smaller, and it would be difficult – not impossible, though – to sew together. If this style of flower doesn’t match your outfit, you may find a flower for you here. Next is a Disney Frozen outfit!